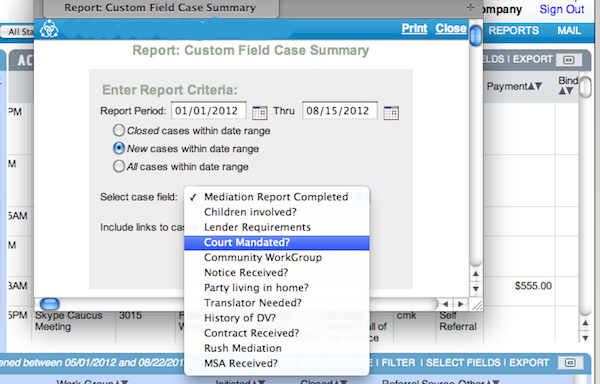 A report can be created built on any of the individual Custom Fields that you have created. 1) In the SETTINGS menu, click on Custom Field Report. Select the custom field from which you want to bulid a report. In the pop-up window select the start and end dates to include in your report. You can also decide if you want to include links in the report to your cases. If you are creating a report for staff that have limited access or if you only need text to copy into another platform, do not include links. If you are creating a report for yourself and you will need to drill down into each case to analyze the date, include links. 2) After your report appears, you can copy and paste the text into another format (to be saved, added to another report, printed, PDF, etc.). You can also click on the links to your cases to create a detailed report. If you have full access, a new window will appear with detailed information for each case.